Published on September 30, 2010 in Business, Drug Trade, Finance, General T&T, International, Media, People's Partnership, PNM, Politics and Security. 8 Comments Tags: British Aerospace, England, Kamla Persad-Bissessar, OPV, Politics, T&T Govt, Vosper Thornycraft. 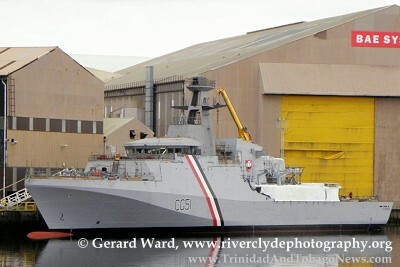 PRIME MINISTER Kamla Persad-Bissessar yesterday confirmed Government has cancelled a deal with a Scotland-based shipbuilding company BAE Systems for the acquisition of three off-shore patrol vessels, ordered by the then PNM government at a cost of TT$1.5 billion.